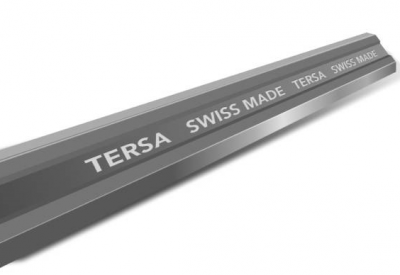 When you choose for the reversible blades from Tersa, you choose for original, excellent Swiss quality. Everything of excellent quality shall be imitated so are products of Tersa. So professional colleagues please note, only Tersa guarantees the grinding quality and long life span you expect from us. With original Tersa blades, we ensure the perfect operating of the whole Tersa tool. Only the Tersa reversible blades in combination with the chisel block are tested and approved. Because only the Tersa brand meets the strict regulations. Do you work with counterfeit blades? Then you take a risk in terms of safety, damage done, consequential damage and other misery that no company is waiting for. Safety is our focus. Tersa blades are not only safe for the machine, but also safe for humans. Did you know that the number of complaints about security after 30 year still is zero? So Tersa is a brand you can rely on. The strength of the Tersa brand is in its superior quality, the hard top layer and excellent fit. Whether you choose for Tersa CR, T1, HSS, M+, Gold or TC: all our blades meet the quality you expect from Tersa. How to recognize the original Tersa blades and distinguish the counterfeit version? Only a real Tersa blade is marked Swiss Made Tersa. So keep focussed continuously and look whether you are dealing with a real knife.